Istanbul, Feb 10 (IANS) The death toll has risen to 21 three days after an eight-storey residential building collapsed in Istanbul, Turkey's interior minister announced. 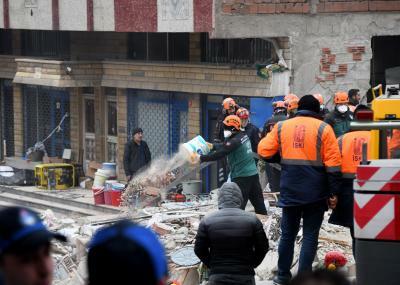 Speaking at a crisis centre near the scene in Kartal district, Suleyman Soylu on Saturday said 14 people had been rescued from the rubble with injuries since the incident happened on Wednesday. The rescue operation has been continuing for almost 74 hours after the incident, the minister added. Earlier in the day, Turkish President Recep Tayyip Erdogan visited the wounded in the hospital.